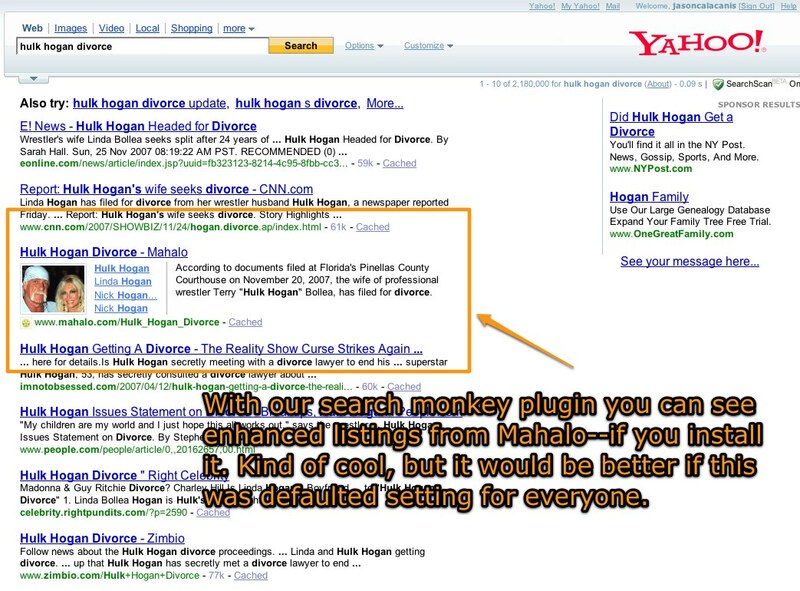 Mahalo’s development team has been playing around with Yahoo’s Search Monkey technology in order to create enhanced listings. As you can see the Mahalo result here for “hulk hogan divorce” has nicer look than a standard result including our Guide Note, related links, and a thumbnail image. The only downside, from what I understand, is that you have to be logged in and install the Mahalo Search Monkey tool. Here are the instructions, or just go over to Yahoo and install it. Question: should Yahoo approve these for trusted partners and make them live for folks without users have to install them? I think their results would look AMAZING if they did.